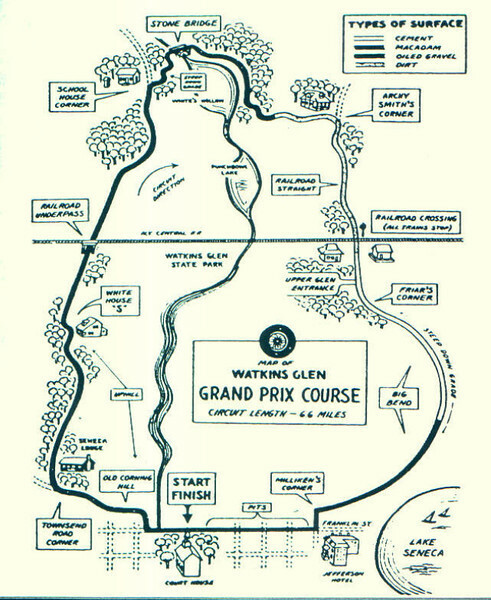 Road Racing came to Watkins Glen in 1948. The project was initiated by Cameron Argetsinger, an Ohio resident (and law student at Cornell University in Ithaca) who often stayed at his father's summer house on Seneca Lake, the family having been in the area since the early 1800's. Argetsinger, an early member of the SCCA, proposed an amateur Road Race to be called the "Watkins Glen Grand Prix" to the Watkins Glen Chamber of Commerce. The Chamber was enthusiastic; Argetsinger selected a 6.6 mile course using mostly paved roads with a short dirt and gravel stretch, permissions were obtained to close a NYC railroad track and the roads needed, and SCCA sanction was obtained. The first race was held at 12 Noon on October 2nd, 1948, a 4 lap qualifying race with a standing start. Source: http://www.silhouet.com/motorsport/tracks/wat.html.